As I continue to ((not so patiently)) wait to receive my wedding photos back, I cannot help but look at every photo and reminder I have of our wedding day! I came across a box of extra wedding invitations and programs, realizing I never shared those with you! Anthony’s question to me pretty much sumed up the creation process of our wedding invites, programs, table cards, menu cards, and every other paper product: “babe, I don’t think it has to be this hard; isn’t there a website where you can just put in your information and have them sent to you?” Yes, Anthony, that’s what the smart brides do. Me, on the otherhand, I’m all about the details and personal touches. When I open a card or receive a gift, I can feel when there’s extra love put into it, which is exactly what I wanted my guests to feel. So, it meant a lot to me that I could design the invites and programs and add personal touches to everything. In the end, they were so well received and I hope my guests felt extra special, so it was worth the blood (paper cuts), sweat (10 trips to the print shop will do that to ya), and tears (definitely a few – and not always happy ones lol). 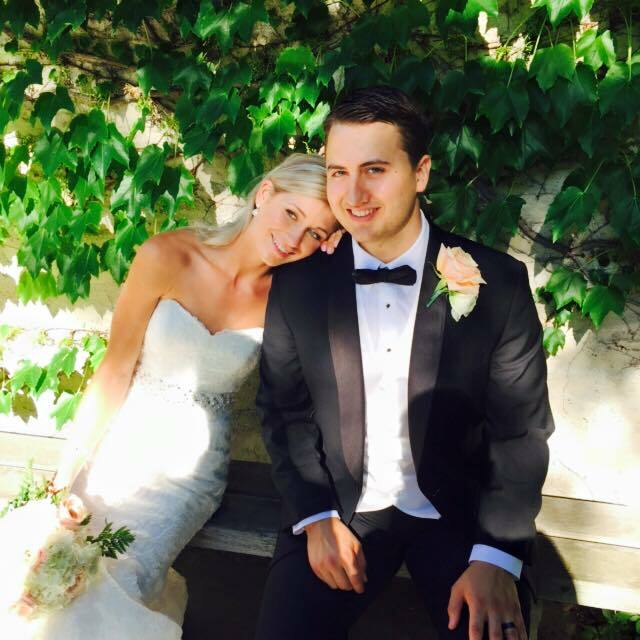 Our wedding colors were white, blush and gold, which created such a romantic feel for everything. 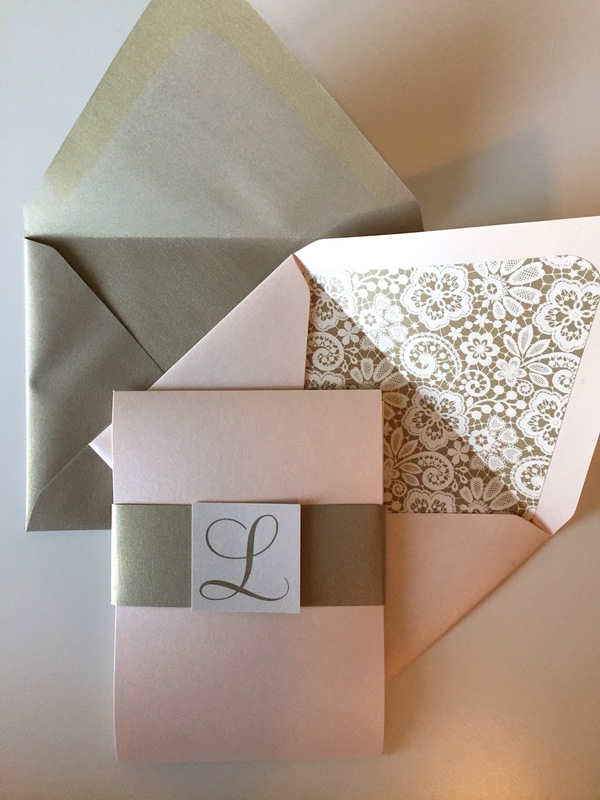 I fell in love with monograms and feminine patters while doing the invites ((Anthony did say: “they look a bit girly” lol oops)) Side note – if every bill came with an invitation liner, I wouldn’t mind receiving them! The invitations were a little over the top, so I wanted to keep the actual paper invite and inserts classic and simple. I couldn’t find a design that I loved, so I designed my own. 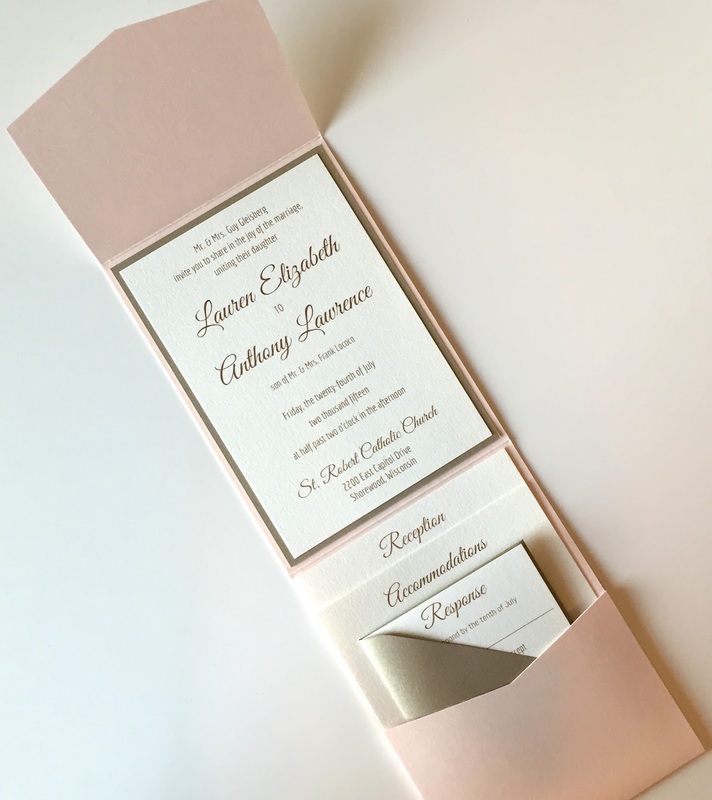 I also loved the look of a pocket invite with the inserts. 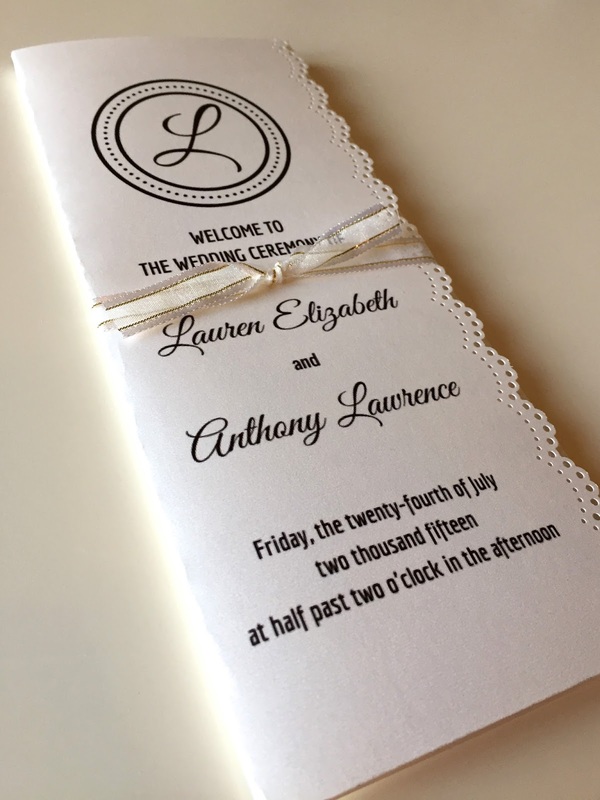 It provided a lot of “space” to get creative and let the invitation reflect Anthony and my style. Anthony and I wanted the vibe of our wedding to be a cross between beautiful elegance and straight up fun! 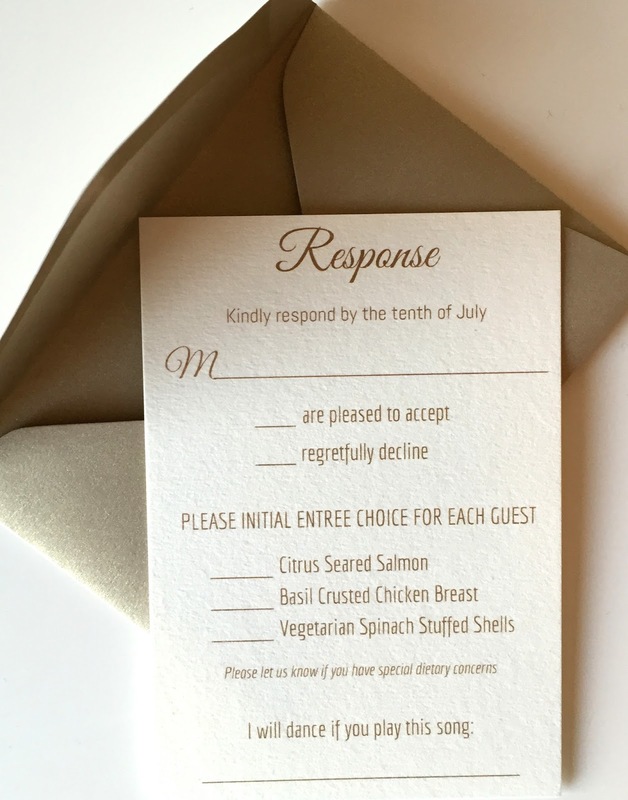 Our guests LOVED the song recommendation slot on the RSVP, and it set that fun tone! I actually had several guests come up to me and ask if my meal was #LGMealPlan approved. That citrus seared salmon with quinoa and veggies certainly was…thank you for asking! However, the pizza served as a late night muchie definitely wasn’t haha. More paper…more problems. And why are there so many shades of white? At one point, I told my mom that if I knew how much energy went into the invitations that I would have just sent out an e-vite. Just like with everything else though, in the end, our guests absolutely adored them and I think they were the most beautiful wedding invitations I’ve ever seen ((but I’m a bit biased ;)) It’s a good feeling for a bride though…every bride deserves to feel that her __invites, dress, day etc.__ are the most beautiful and representative of her and her husband! The wedding programs were created around this paper edger that I found while roaming the aisles at Hobby Lobby ((this is the exact one)). It was a lace pattern, which fit perfectly with the soft, romantic theme. I was able to also use it on the table and menu cards! However, I didn’t realize that it means hours and hours of paper punching and some serious blisters on my palm thanks to the extra thick paper I always seem to be choosing. I was also set on adding in tissues for those “tears of joy, tears of laughter, tears of happily ever after” and I enjoyed a few giggles watching some guests pull them out of their programs to use during the ceremony! I just loved your invites and the wording you used is really amazing and heart touching. Thanks you so much for sharing. I have also decided to get married at best Hollywood venues and will definitely go for your invitation idea.